We want to make sure you’re confident you’ve chosen the right cleaning company and that we fully understand your expectations before we start working with you. So, together we’ll identify the tasks you need done daily, together with weekly and additional periodic jobs. The result will be a tailor made cleaning programme for your business and a clear specification of what to expect from us. We’ve taken great care to minimise our impact on the environment by, as far as possible, using environmentally responsible products and methods. Our approach supports your own corporate responsibility and ecological targets. We’ll always work around your needs. Our services are available daily, weekly, fortnightly, and monthly – early mornings, evenings, and weekends. Once we understand the dynamics of your office or practice, we can set up a programme to provide a recycling structure for your waste. Working with management companies and residents’ associations, we carry out periodical internal and external cleaning, and ground services. Our tailored cleaning specifications are in line with Patient Safety in General Practice requirements, and we’ll prepare and implement an audit system to record cleaning on your premises. This allows us to work with you to make sure you meet the Care Quality Commission’s fundamental inspections, or to support your EYFS and OFSTED obligations. 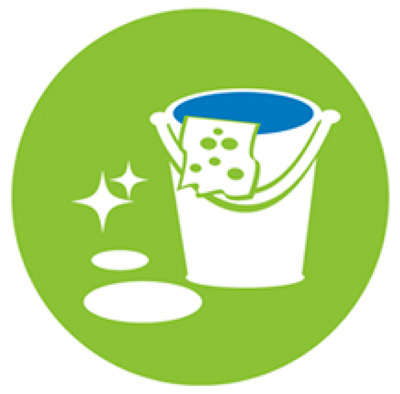 Our professional ‘Reach and Wash systems’ bring you the highest standards in environmentally responsible cleaning. This accredited system provides the most up-to-date eco-cleaning methods with excellent results, making sure your offices always look their best. We use high-performance carpet cleaning machines together with environmentally safe products made from the latest ecological surfactant formulations, fragranced with natural lemongrass, eucalyptus, and tea tree. Our service includes environmentally friendly consumables including black bin bags, washing-up liquid, hand soaps, toilet rolls, paper hand-towels, and personal hygiene units. Member of the British institute of Cleaning Science (BICSc) www.bics.org.uk An independent, professional and educational body within the cleaning industry, BICSc provides education, professional standards and accredited training, promoting sustainability and providing best practices. As a BICSc member we follow their standards and code of practice. We are working towards BS EN ISO 9001, and BS EN ISO 14001, in line with 2015 standards. "I’ve subcontracted Michelle’s commercial cleaning services for over 10 years. She is an honest and proactive professional who does thorough research to carry out cleaning services to a high level. Michelle’s management skills ensure a clear and simple methodology to cleaning and hygiene requirements, which supports client‘s needs. Her attention to detail has supported my role as a services manager for many years." © Paragon Cleaning Management Ltd.